Soccer star and seventh-grader Samantha Williams. Williams has always had a passion for soccer, having played competitively all the way through high school at Mira Costa in Huntington Beach. The TV in his office is always tuned to the soccer channel, and he still plays pick up games whenever he can. And through all the travel and tournaments, he still enjoys being a soccer dad. Like her father, Samantha has taken to the sport in a big way. “It’s a really beautiful sport if you watch the amazing things people can do with the ball,” said the gifted 13-year-old Thurston seventh-grader, who currently plays for West Coast Futbol Club U14, one of 77 clubs around the country in what is called the Elite Clubs National League. 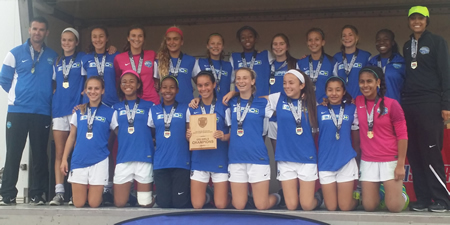 Midfielder Samantha Williams, center with trophy, leads her winning squad. After a series of grueling workouts, ODP coaches narrowed a group of several hundred, first to 48, and then to 18. “It’s kind of like the best of the best,” said Gus Castaneda, coaching director for the West Coast Futbol Club and Samantha’s U14 club coach. Her swiftness and soccer smarts made her a starting midfielder on the elite team, a position akin to a football quarterback, where quick decision-making and quick feet are a must. 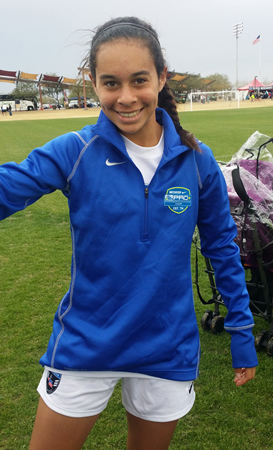 Samantha traveled to Phoenix last January with her Cal South ODP teammates to compete against teams from Alaska to Hawaii in the Region IV ODP championship, where they went 5-0, outscoring their opponents 21-0, including a 7-0 win over Hawaii for the title. Every summer and winter until age 18, Samantha hopes to have more opportunities to make ODP teams. It’s a good way to get the recognition she needs to reach her “bigger goal to eventually make the U.S. women’s national soccer team,” she said.